Home Theater A Pretty Genius Spoof of Hamilton Is Finally Coming to L.A.
A Pretty Genius Spoof of Hamilton Is Finally Coming to L.A.
It’s said that imitation is the highest form of flattery, but in musical theater, parody takes top honors. No one is safe from the unsparing gaze of Gerard Alessandrini, godfather of the satirical revue and holder of nothing sacred, who’s been eviscerating musicals since 1982. His Forbidden Broadway series spoofed behemoths (Wicked, Les Misérables) and flops (Spider-Man: Turn Off the Dark) in more than 200 cities before it closed in 2014. Then Hamilton came along. 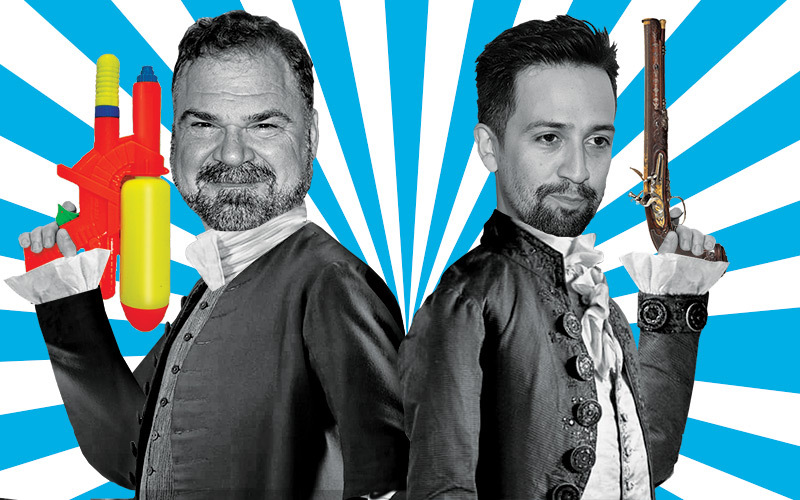 Last year Alessandrini premiered Spamilton: An American Parody in New York to rave reviews. On November 5 it opens at the Kirk Douglas Theatre in Culver City. The timing couldn’t be better, considering Hamilton’s current run at the Pantages, which you can catch—or try to catch—until December 30. Lin-Manuel Miranda’s hip-hop juggernaut about the life and times of Alexander Hamilton provides the blueprint for Spamilton, though you won’t hear riffs on every song from the original soundtrack. Alessandrini takes aim at Miranda’s status as the Savior of Broadway in a song called “His Shot,” where a caricature of Miranda raps about his own awesomeness; “The Film When It Happens” sees Aaron Burr contemplating Hollywood’s take on Hamilton (Johnny Depp as Hamilton? Russell Crowe as Burr? “What will they pay Lin to get him to sell his performance down the river?” Burr sings). Hamilton provides Alessandrini ample ammo (Hammo? ), but he still manages to roast other musicals during the speedy 80-minute show: A Sondheim-themed section pits one notorious lyricist against another; a pair of Mormons claims that Hamilton has wiped out their audience. Divas like Barbra and Liza get some face time, too. With tickets for Hamilton pushing $1,600, this Miranda-approved spin-off might be the young, scrappy, and hungry set’s best alternative.